Death. Testament. Autopsy. These are bands that rose to prominence in the 80s and 90s in thrash and death metal. Do you know what they all had in common? Steve DiGiorgio on bass. Steve is a whirlwind of a player. He’s known for blazing speed and fretless playing. I’ve combed the internet, and I can’t find video interviews with him anywhere. However, his playing has become an important part of the fabric of metal history. When I think of heavy metal bass, the first person who comes to mind is Steve Harris. However, when I think extreme metal bass, the two players who always top the list for me are Alex Webster and DiGiorgio. Steve is a blend of schooled and self-taught bassist. Interviews on the internet state that he played different instruments in school, including woodwind and brass, before moving on to stringed instruments. He learned to read standard notation in school as well. He says that when it comes to metal, however, he learned by ear, sitting by the radio and playing to albums. After starting his first band, Sadus, during his last year in high school, he became a session player for a lot of Bay Area metal bands including Death and Autopsy by virtue of being friends with many of the players. Most of these albums were very well-received in the metal underground. Death, in particular, really influenced extreme metal with their entries, especially Human (1991) and Individual Thought Patterns (1993). The latter also featured DiGiorgio on fretless bass, something he says that he took up because he liked the sound. He said that there are tones available on fretless that just can’t be gotten on a fretted bass and he wanted to make that part of his sound. He kept it because it also differentiated him from other bassists at the time, which I find interesting because he claims to not have a signature sound. Here’s a PDF “beginner” lesson he wrote about 3-finger technique. And, speaking of Jeroen, I believe that DiGiorgio actually filled in for him when Obscura went on tour in Japan in 2010, due to work restrictions which Jeroen had to abide. Bass Player Magazine has a great interview with DiGiorgio from March 2010. Towards the end, questions are asked about Steve’s thoughts on the role of bass in modern metal, and how it differs from the late 80s and 90s, and he’s asked about what he thinks of seeing new technical and prominent bass playing in metal. I realize that I’m writing quite a bit on this, and its probably better for interested readers to go straight to the source for this information, so I’m including links to several interviews below. The interview on FretlessBass.com, in particular, delves deeply into his musical influences and fretless playing. Its really interesting to me to read that he listens to a lot of Hindi and mid-eastern music. This is similar to Jeroen Paul Thesseling, who is apparently close friends with DiGiorgio, and hand-picked him as his replacement when unable to tour with Obscura. This entry was posted on April 2, 2011 by vishalicious. 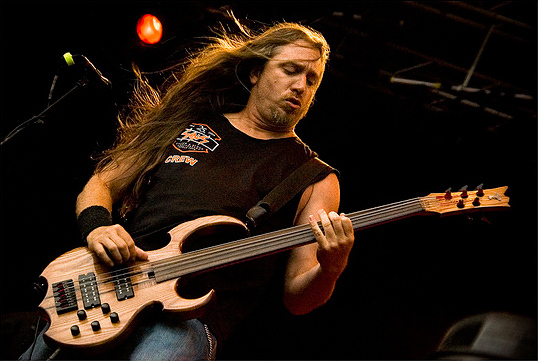 It was filed under Bass Guitar, Bass Players, Music Video, Technique and was tagged with Alex Webster, Autopsy, bass, Bass Guitar, Changing Weather, Dark Hall, Death, fretless bass, Jeroen Paul Thesseling, metal bass, Music, Obituary, Obscura, Sadus, Steve DiGiorgio, Steve Harris, Testament.